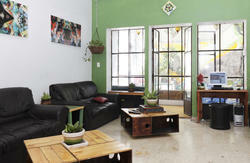 Welcome to Hostel Galeria Guadalajara, one of the best hostels in Mexico!!! Enjoy a wonderful stay at the heart of the city, we have an outdoor bar, , full kitchen, games room with cable Tv, free WiFi, laundry service and all our beds al double size. Start the party at the hostel and then continue at Chapultepec Avenue just 3 blocks away, there are many options from salsa to electronic music for you to choose. Hostel Galeria Guadalajara has the best location in downtown !! On foot, we are only 4 blocks and a half from Chapultepec Avenue.